My Autumn Garden -- Inspired by Bloggers! Creative projects -- I'm enthusiastic about beginnings and middles, but less energetic, focused or punctual about endings. That's why I signed up for Magpie Girl's Creativity Challenge. I'm about 90% finished my Autumn garden and think I will be able to meet the Challenge's November 1st deadline. I've posted some of the plant creations on Flickr and will be adding more photos and notes this coming week. Decision-making -- for me, the process is never fast and rarely final. This is another area where I need help and largely explains why I have trouble finishing projects on time if at all. 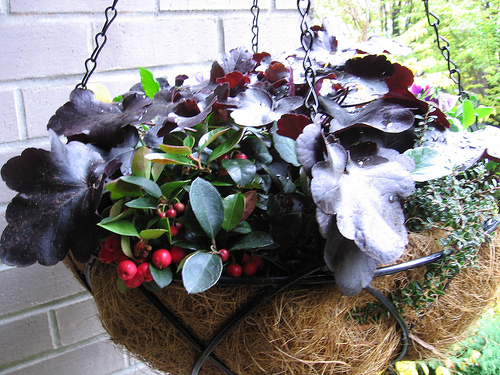 For my Challenge Project, I needed help choosing plants and creating container combinations. This is where my blogging friends came in -- little did they know. And I hope they don't mind how I used them. 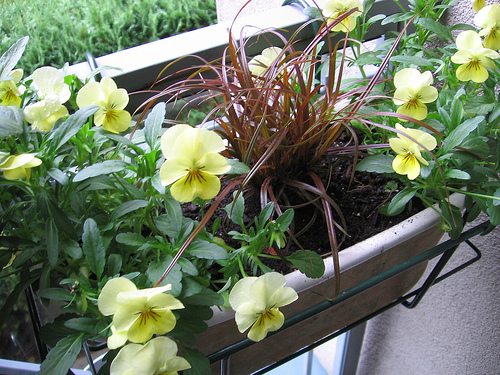 Note: I admit only the pansies, violas and wintergreen are -- technically -- edible plants, although I don't plan on eating them. 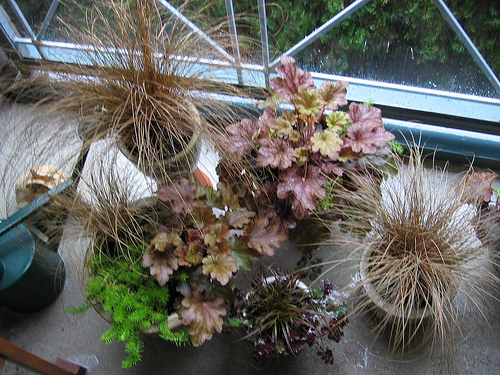 Next Spring, I will be transplanting about half the Heuchera to my mom's garden and replacing them with lettuce, other veggies and herbs. Yes, I'm one of those kids who stores stuff at the parent's place but in this case, my mom doesn't mind. Moi in Copenhagen -- plants suitable not only for the Pacific Northwest but also, I believe, Copenhagen's growing zone. (In one gardening forum, a contributor said it was zone 7.) Summer alternative to the pansies and violas: the national flower of Denmark, the Marguerite Daisy (Argyranthemum frutescens). Lemon & Mahogany -- lemon-yellow may not be a true Autumn colour but we need a source of sunshine during Vancouver's rainy, dull fall and winters. 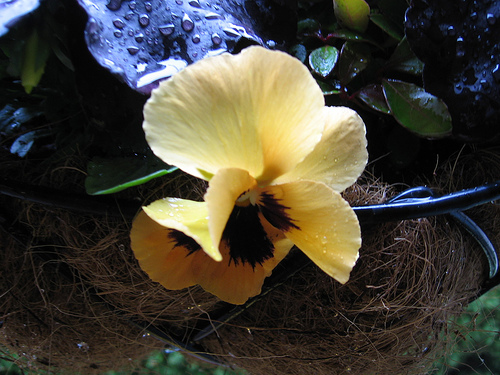 Mondo Beyondo -- is the only word to describe this lush mound of Black Mondo Grass and two prolific pansy plants that have flowered continuously and abundantly. Anchors & Masts -- this one is a bit like looking at clouds. Do you see the mast, the sails, the anchor?